Here’s the latest from NOTCOT’s London-based editor and resident zoologist, Justine Aw as she explores the 2014 London Design Festival. The 17th edition of Designersblock as part of this year’s London Design Festival at the The Old Sessions House, an 18th-century courthouse on Clerkenwell Green. 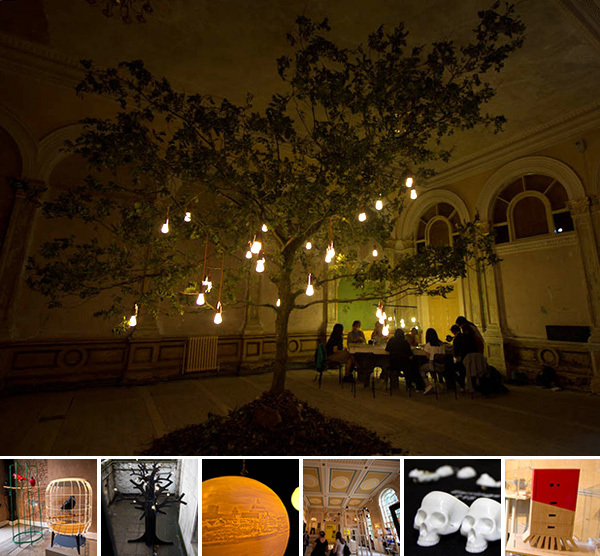 The best use of the space was the Glowing Oak from Plumen found on the top of four flights of stairs! They transplanted a whole oak up there magically illuminated… breath taking! And on the way there, of course the courthouse was filled with quite the contrast of stunning, playful modern designs inspiring us throughout… see all the beautiful details on the next page! Pieces from Milton Priest with The Peanut Gallery in the fore and Monsieur Flaubert behind. The Old Sessions House made a great venue for the show, contrasting with the modern designs within. The Flauti series from Giopato & Coombes. Bolle from Giopato & Coombes. Porcelain lithopane lighting by Beth Lewis Williams bringing together 3D printing, hand carving and LEDs. Traditional Futures by Shubhi Sachan using rice husks. Porcelain rings from Alex Garnett, formerly half of Mixko - fun to see my favorite porcelain skull rings still out there! The mesmerizing ceiling projections working with the courthouse architecture. The Voltage Coat Stand by Fanatic House. Los Enmascardo by Ana Jimenez Palomar. Following the Plumen bulbs up to the top of the old courthouse. Arriving at the top of four flights of stairs, we found an unexpected oak tree! The Glowing Oak from Plumen made a beautiful centerpiece and provided a gentle illumination for the jewelry making workshops.